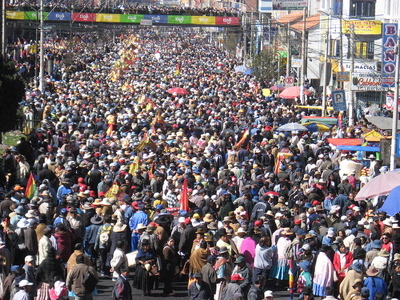 Tens of thousands of peasants, miners, coca-growers, and other supporters of the government of Evo Morales arrived in La Paz on Monday. What had originally started as a march to apply pressure to the Bolivian Congress to pass a law calling for a Referendum to approve the draft Constitution ended as a celebration when the lawmakers reached a compromise, and seemingly pacified the country after several volatile months. Luciendo orgullosos sus vestimentas tradicionales, empuñando banderas tricolores y wiphalas, con bolsas de coca y con un poco de comida en sus mochilas o aguayos, miles de bolivianos y bolivianas, del campo y la ciudad, iniciaron hoy una marcha desde Caracollo (Oruro) hasta La Paz (sede de gobierno) con una sola premisa: la aprobación de una ley de convocatoria a referéndum sobre la nueva Constitución Política del Estado. Proudly displaying their traditional dress, carrying tri-colored flags and wiphalas (the flag representing indigenous peoples), with bags of coca and with a little bit of food in their backpacks or aguayos (traditional textiles used for carrying purposes), thousands of Bolivians from the countryside and city, started a march from Caracollo (Oruro) to La Paz (seat of government) with only one purpose: the approval of a convocation law for a referendum for the new Constitution. Many bloggers were ready for their arrival and captured the images prior to their arrival and upon their arrival. Nelson Vilca of La Mala Palabra [es] has some photos from the highway. Hugo Miranda of Angel Caido [es] also took videos and photos of the marchers along the highway. Many can be found on his Flickr site. See more videos at Miranda's YouTube channel. Fui sorprendido por la cantidad de gente en marcha, la recepcion popular, agua, refresco, comida… todo era para los marchistas. Lo otro era el rostro de los campesinos, su paso era recibido con aplausos, con vivas y con abrazos. I was surprised by the number of people who were marching, the popular reception, water, soda, food… everything was for the marchers. The other was the face of the peasants, their steps were received with applause, with cheers, and with hugs. Photo by Mario Durán and used under a Creative Commons license. To see his full album visit the Flickr site of Voces Bolivianas. ¡Evo hermano, el pueblo está contigo!, al unísono era una de las frases que salían de las voces de ciudadanos y ciudadanas que habían salido a las calles a dar la bienvenida a la gran marcha encabezada por el Presidente de la República de Bolivia, Evo Morales Ayma. Eran aproximadamente las ocho de la mañana de este histórico 20 de octubre cuando el Presidente Morales, se unía a la marcha en el sector de Senkata, El Alto, llegando un poco antes de medio día a la Ceja a la altura del Multifuncional. Hace cientos de años atrás era ese sector también donde las huestes de nuestro líder indígena Tupac Katari se concentraban para ingresar a La Paz. A su paso por este sector, la marcha fue recibida con vítores de la multitud que se había apostado en el lugar, además de una banda de música y los aplausos que se repitieron a lo largo del recorrido que hicieron los marchistas. Evo, brother, the people are with you! was one of the phrases that could be heard from the voices of the citizens in unison, who came out into the streets to give a welcome to the grand march headed by President Evo Morales Ayma. It was approximately eight o'clock in the morning on this historic October 20, when President Morales, joined the march at the area of Senkata, El Alto, arriving a little before noon at the Ceja near Multifunctional. Hundreds of years ago, in that area is where the supporters of our indigenous leader Tupac Katari assembled to enter La Paz. Passing through that sector, the march was received by cheers from the multitude that had gathered there, in addition there was a musical band, and the applause was repeated the entire length of the marchers’ path. 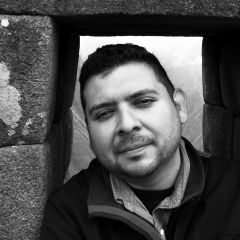 Pero el proyecto de CPE aprobado en Oruro por la inconclusa Asamblea Constituyente es una base, mas de 100 artículos han sido modificados por el congreso, tal cual se modificaron las mayoría de las constituciones que ha tenido Bolivia, vía congresal. ¿Fueron necesarios los muertos de Sucre? No, si igual el proyecto lo modificaría el Congreso; ¿las huelgas? tampoco; ¡¿los 125 millones de Bolivianos?! Fueron tirados a la basura, 18 millones de dolares que pudieron ser usados en 18 pequeños hospitales especializados en ancianos y discapacitados. The Constitutional project approved in Oruro by the inconclusive Constituent Assembly is a base, more than 100 articles were modified by Congress, which the majority of Bolivia's Constitutions were modified by the Congreess. Were the deaths in Sucre necessary? No, when the same the project would be modified by Congress. The strikes? No, as well. The 125 million of Bolivians (national currency)? They were thrown in the trash, 18 millions of dollars could have been used in 18 small hospitals for the elderly and handicapped. Miguel Centellas of Pronto* is pleased that the matter was settled legislatively and that this “is therefore an important step back towards institutionality.” He also notes that other changes include departmental autonomies. With this, Bolivia awaits several new elections are on the horizon including a referendum on the new Constitution scheduled for January 25, 2009 and general elections in December of 2009. So the Constitutional Assembly wrote a draft constitution and then the Congress “re-wrote” it? This doesn’t sound even close to Democratic. What were these modifications? What changed, and what was spared from this re-writing? Are the indigenous rights guarantees and the reforms promised by Evo Morales still in the new draft? I must confess I’m somewhat puzzled by the whole situation.